One of the great joys of growing your own vegetables and fruits is that you have complete control over exactly what you grow, and how you grow it. And because you can harvest and eat them when they’re perfectly ripe and fresh, none of those all-important nutrients are lost. If your priority is produce packed with nutrients, you can really up the ante. Read on or watch our video to for our countdown of ten of the most nutrient-dense crops that are sure to give you the glow of good health! Good for the heart, great for weight loss and a boon for healthy eyes, teeth and bones, courgettes are first up on our list. They're a great source of vitamins C and A, which help to boost the immune system and guard vision. Courgettes are very easy to grow and, when picked regularly, will give plenty of versatile fruits throughout summer. Cut them young, just 4in (10cm) long is ideal. Or let them grow a little larger for spiralising as a lower-calorie alternative to pasta. Beans, beans, good for your heart – and they really are! Beans are naturally high in protein and a great source of soluble fibre, which helps to reduce cholesterol. Darker beans have high levels of disease-fighting antioxidants. Add in other heart-healthy compounds such as flavonoids and it’s clear beans should be part of every vegetable garden. 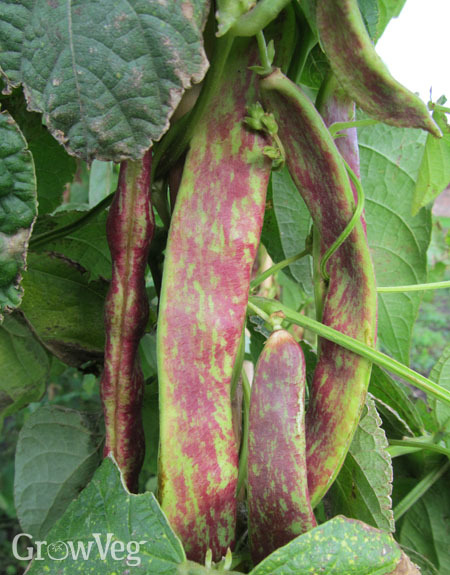 Summer’s a great time to start off quick-growing dwarf beans, which are ready to pick in just six to eight weeks. Crammed full of fibre, antioxidants, vitamins and minerals, kiwis claim a catalogue of health benefits, including reducing the risk of heart disease and respiratory problems. Weight for weight kiwis contain more vitamin C than oranges, making them a very easy way to get your recommended daily allowance. Look for a self-fertile variety if you only have the space for one kiwi vine. Grow it in a warm, sunny position against a wall or up trellis. Tomatoes are a summer favourite, with many shapes, colours and sizes to choose from. We love them for their aroma, taste – and their nutrient dense fruits – which include vitamins A, C and E, anti-inflammatory flavonoids and potassium. They’re also chock full of lycopene, which may help to prevent some cancers. Smaller, red tomatoes contain the highest concentration of lycopene. Grow your tomatoes somewhere sunny and feed them regularly with an organic liquid tomato fertiliser for the tastiest, healthiest tomatoes. Like tomatoes, red and orange peppers are a great source of lycopene, as well as vitamins C and A, which make sweet peppers a powerful antioxidant. All peppers grow best in a warm, sunny position and will benefit from the protection of a greenhouse in more temperate climates. Top-heavy peppers will need tying into a central stake to keep them upright. You can pick them when they’re green, but leave them to colour up for maximum taste and nutrient density. Broccoli, or calabrese, is a cruciferous vegetable that along with others such as cauliflower and cabbage is known to contain compounds that help to inhibit cancerous cells. Folate, fibre, calcium, vitamins A and C – all of these work to improve how our bodies function, and how we feel. Very fresh broccoli is best – so it’s worth making some space to grow it. Broccoli needs fertile soil that’s high in nitrogen. You can sow broccoli in summer to plant out a few weeks later, for an autumn harvest. Pick the heads while they are still tight and well-filled. Packed with nutrients, including antioxidants and B vitamins, raspberries are an all-round boon to your health. Pick and pop the rich red berries to strengthen your immune system, prevent infections and improve eye health. Raspberries contain ellagic acid, a compound that may help to prevent some cancers. Grow a range of both summer and autumn-fruiting types to prolong the harvest. Tie the canes into a post and wire system and add an organic mulch to lock in moisture and keep the roots cool. Another berry positively bursting with nutrients is the beautiful, dusky blueberry. Blueberries are a well-known health booster, containing a cocktail of essential nutrients, from zinc, copper, vitamins and iron, to a hearty dose of the powerful antioxidant anthocyanin. Blueberries can boost your brain, with studies showing a link between their daily consumption and a slower advancement of Alzheimer’s. Grow blueberries in acidic potting soil, in a sunny spot, and choose a range of early, mid and late season varieties to extend your harvest. Garlic’s the go-to staple for so many recipes. And the good news is it’s incredibly good for us! Garlic is great at boosting the immune system thanks to high levels of vitamins such as B1 and B6, and nutrients including manganese, calcium and tryptophan. It’s great for our livers and can help to maintain healthy lungs and stomach. Leave chopped or crushed garlic to sit for 20 minutes before eating to increase these benefits even further. Garlic loves well-drained, fertile soil. You can plant it in the autumn to give an early summer crop. Number one on our countdown of nutrient-dense crops is kale, which along with other leafy greens such as spinach is a great source of fibre, vitamin C, omega-3 and -6 fatty acids and antioxidants. Kale is a real nutritional powerhouse – great for the immune system, an excellent anti-inflammatory, and with its rich source of nutrients, it’s sure to give your skin, nails and hair the boost that will get you glowing! Kale is very easy to grow. Sow in spring then plant out once the young plants are about four inches (10cm) tall. We love the strap-leaved dark Tuscan kale for both taste and nutrition. All of these crops are intensely good for you, so try to grow a few in your own garden. Of course all fruits and vegetables have their own health benefits, so if there’s one you particularly recommend why not let us know about it in the comments section below? "You should post pictures of all the fruit and veggies discussed, not just some of them as the way you have it now is somewhat confusing. It looks as though you're trying to tell me that tomatoes are Kiwi, and that blueberries are raspberries. You need to design this page more coherently"
7 Naturally Sweet Crops to Satisfy Your Sugar Craving!